Me blogging? That seemed as likely as my taking up neurosurgery. Nevertheless here I hang, somewhere in the boundless horde of bloggers. Two years ago seems like yesterday, probably because not that many posts have appeared here compared to some dedicated Genea-Bloggers (the ones who function on two hours of daily sleep or less). I do have fond memories of being able to pack about thirty hours into a 24-hour day but now I make do with about eighteen. Hours, that is. I don’t want to know how many white spots are eating up my brain. A thank you and a hug to every new friend (old ones too) who coached me, supported me, encouraged me. I am humbled by the talented, active minds out there who impart genealogical lessons and case studies in the most reader-friendly way. Thank you for the tips, the fun and the interesting reading. The beauty of a blog is being able to communicate, hopefully, that family history has so many fascinating anecdotes, coming from both research insights and memory collections. My goal has always been to try to interest family and friends who normally don’t give a hoot about genealogy. The medium allows for relating aspects of serious studies in an informal way. I’ve been very lucky that a number of unexpected cousins have found me because of my blog—let’s give a grateful nod to Google here! Bear with me, Cuz People. There’s more to come, happy to get to know you, always thankful for your contributions, always sprinting (staggering?) onward. 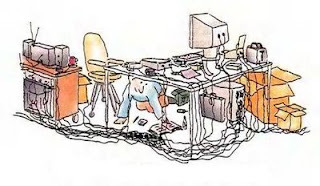 Cartoon unfortunately uncited, retrieved from a lost email message, more than two years ago. 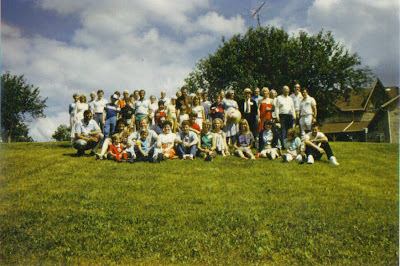 At the end of June 1984 the one and only (so far) DOUGALL family reunion was held at Finisterre Farm in Puslinch Township (near the city of Guelph) in Wellington County, Ontario. 1984 was the 150th anniversary of patriarch John Dougall’s arrival in Canada from Scotland, so launched the idea. This felicitous happenstance was created without the slightest idea of how a family reunion should be managed. Then ... there were no informative guidelines and booklets as are available these days. John Dougall came to Canada and settled in Argenteuil County, Lower Canada (Quebec) with his wife and the eight children who lived to adulthood: Thomas (1811), John (1816), George (1818), Margaret (1820), Jean (1822), Peter (1824), Marion (1829) and Helen (1832). Their son John (1814) had been killed in a farm accident in 1833; two daughters Margaret (1813) and Marion (1826) died as infants. I have never calculated how many descendants John might have had down to the sixth or seventh generations, but our group was very representative, for a day of socializing and barbecue. The reunion was lively with those of us who already knew each other, and emotional in meeting cousins from afar. They came from Ontario, Quebec, Maine, Connecticut, Michigan, Illinois, Minnesota and of course the surnames varied widely. Besides DOUGALL we had Black, Blue, Jaeger, Kingston, Locke, Madsen, Maughan, Merriman, Molluso, Morrison, Turta and Watts descendants. The Scots weather gods cooperated beautifully. Personal recollections of the event recall teenage cousins perched on the roof of the century stone farmhouse (learning to smoke dope already?) busily planning to re-visit in Manhattan. Our ultralight pilot was at the ready on the cornfield runway, thrilling the adventurous with flights over the party. A piper came to visit; what is a Scottish gathering without one? A large display table was where we shared memorabilia, with the circa 1866 photo of John Dougall and his wife Marion Hastie (see here). We asked people to fill out their parts of a huge family chart. Our oldest-and-youngest acknowledgment went to Peter McAdam Dougall aged eight-four from Minneapolis MN, and Peter John Paterson Dougall aged four from Bolton ON, ... proudly bearing family heritage names. Honestly, we had some prizes for a few contests like this but whatever they were escapes me. Signs pointed to chez les trois jolies jeune filles. And all their helpers, including fence posts. We’ll always remember this family day. For everyone here, we’re toasting the Dougalls!" 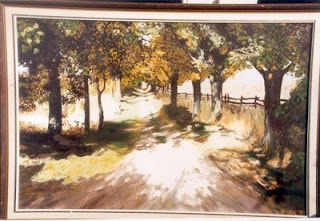 Family photograph of "Lane to Finisterre Farm," a painting by CLDM c1980. Folk Art along the Cabot Trail, July 2006. Photograph by BDM. ... but lagging in all directions, pretending to multi-task among writing up minutes for two completely different organizations, sorting out book review commitments (reading the books was a good idea, too), madly researching for a potential article before the Archives of Ontario absconds to the distant suburbs, looming conference tasks and dreaming about a future rendezvous with camels. Is that a good enough excuse? Oh ... and sometimes my kids have to remind me I have kids. Actually, I have two photographs of the same pair. Once known as Way-way and Ba-ba. Number one features brother and sister in their dress-up best for the camera. Who forgot to tell them to smile? Scary photographer? Nevertheless, who would argue they are perfectly darling. Dig those boots loaded with white shoe polish. The sailor suit is preserved as a family artifact. Number two is way more fun, posing just before the local Ice Carnival. Even more adorable, n’est-ce pas? Mouse soon firmed up his blades to graduate to the more manly Canadian sport of hockey. 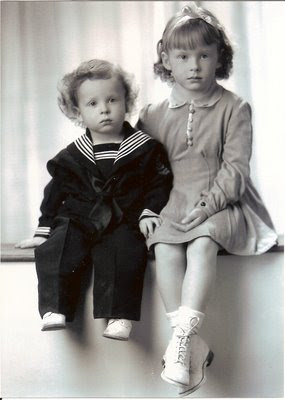 Photographs c1940s, BDM family collection. Just to address one recurring query. There is no evidence whatsoever that my Dougall family line was ever known as, or connected to, the surname MacDougall. It’s surprising (to me) how often I get that question, since the surname is much less common than the Mcs and the Macs. Dougall was the surname by which they were recorded in West Lothian parishes back to the mid-1700s ... when I lose them. One of my potential ancestors is Iaian McNeill Vc Innes, meaning Ian (or John), son of Neil who was the son of Innes. (2) Celtic Bards were a customary part of the clan fabric, preserving and memorizing the intricate genealogy of their leading families. In an illiterate society, they were expected to declaim and entertain at social gatherings. And let us not confuse the Gaelic language with that of the other part of the country – Scots, or Lowland Scots. It would make more sense–to me anyway–that the “adoption” of Dougall as a surname sprang from some man named Dougal/Dugald who migrated to the area around Edinburgh and whose descendants had lost or dismissed their Highland origins and clan or old community affiliation. My imagination was captured years ago when I read of Dugal, son of Somerled, who became Lord of the Isles in the 12th century. Then I was seduced by the global fashion marketing spawned by Queen Victoria’s devotion to Balmoral Castle and all things Scottish. Ah yes. Those brawny lads in their colourful kilts. The proud regimental backbone of the British army. The novelty of Highland games and the thrill of the bagpipes. The images thrive to this day, most of them manufactured to a point a poor old crofter wouldn’t recognize. Anyone can claim a clan affiliation and deck themselves out in tartan ties, kilts, shawls, blankets and what have you. Maybe hang a clan chief’s hereditary coat of arms over the fireplace in the family room, obliviously committing an illegal act. Then I became a genealogist and guess what? My ancestors were likely not prancing around in clean argyle socks and immaculately pleated kilts with silver pins. Researching ancestors goes hand in hand with seeking the realities of contemporary history—the social, political, economic, religious, literary and legal context for my people. How boring is it to say John Dougall lived on a farm in West Lothian, Scotland? Where is that place on a map? Who owned the farm? What was his working life like? His home life? What was happening around him in the nearby towns or in the country itself? What influences or pressures made him decide to go to Canada? You can’t always answer all the questions, but looking for them makes all the difference. Now that we have that all cleared up, don’t forget your handed-down family stories much closer to home. The tales are personal historical sources. They may be altered through time, they may be incomplete, they be may be biased and embellished, they may be mixed up, but they are yours—to save and investigate. I was all over the map with that one. (1) William L. Kirk, Jr., “Introduction to the Derivation of Scottish Surnames,” 1992, Clan Macrae Online (http://www.clanmacrae.org/documents/names.htm : accessed 14 January 2009). (2) Nicholas Maclean-Bristol, From Clan to Regiment, Six Hundred Years in the Hebrides, 1400-2000 (UK: Sword and Pen Books, 2007), pp. 78-79; citing Inverary Castle Papers, Fullerton Transcripts 2 July 1679; MSS AT 1679, Edinburgh University Library. One of Lawrence of Arabia's campaign headquarters, Qasr el Azraq, northeast Jordan. Photograph BDM October 2007.